​West Linn Lutheran Church (20390 Willamette Drive, West Linn) invites you to “Heart to Heart”, a joyous Pentecost event of music and fellowship on Sunday, May 20th. The WLLC Choir will be sharing the “Missa brevis Sancti” by Joseph Haydn in the 8:15 am and 10:45 am worship services. The choir will be joined by a small orchestra in the second service. This piece is known to stir hearts in a mystical way, and the choir is eager to share it with the community. WLLC’s worship and Holy Communion are open to all people.Starting at 9:00 am, guests to the church can browse and bid at a silent auction, buy homemade baked goods and healthy plants, and discover a wine rafflewall, all while enjoying a continental breakfast. Proceeds from these activities will support a mission team traveling to Romania in July. The team of 9 youth (middle school through college) and 12 adults will be doing service at a Hungarian Lutheran church in Sacele, and a Habitat for Humanity build in Buftea. That build will be helping complete a community center serving low-income families. To learn more about the church and the trip, visit www.wllc.org. Questions can be addressed to wllcoffice@wllc.org or 503-656-0110. There are 23 travelers going to Romania next summer to visit our companion congregation and to work with Habitat for Humanity. We are raising funds to accomplish this trip. Our fundraising goal is to pay for the 10 youth and 3 chaperones. This fundraiser is an "Arch of Envelopes" in the front hallway! It's our version of Romania's Arch de Triumphant. Theirs is built from wood. So is ours. Each envelope has a monetary amount written on it. The amounts start at $1 and ends at $200. If every envelope is taken it will pay for a majority of our Habitat build fees. Please take an envelope: any amount helps. Grab one at random and see what you are called to give! Or look them over and intentionally take an amount- perhaps one that challenges you to give generously! We appreciate your support of this congregational ministry! We have chosen a location for our Thrivent Build/Habitat mission trip to Romania in July/August of 2018. 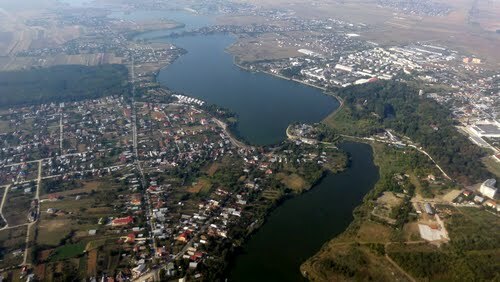 Buftea Romania. We will give you more information about this site as it becomes available. Register for this event by clicking the Register Here button above. Visiting our Partner in Sacele! The first part of our trip will connect us with our partners of 15 years in Sacele - with Pastor Lazlo and his community. Those who have currently expressed interest are excited about this component as we seek to further our relationship through face to face, people to people contact. Make a powerful impact in the lives of families and communities worldwide by helping where it is needed the most. Develop lifelong relationships and experience new and beautiful cultures from around the world all while building houses – and strength, stability and self-reliance. From the deserts of Africa to the rain forest of Vietnam, or the mountains of Montana to the tropical beauty of Hawaii in the United States, Thrivent Builds Worldwide can take you on a journey of truly living generously. We see this service project in partnership with our friends in Sacele Romania and Habitat for Humanity as a part of our mission statement to serve all people. In serving all people we feel it is important to meet them where they are and to enter into their story. This cross-cultural, cross-religious connection serves to further our deeper connection as fellow human beings. If you are interested fill in your name, your email address and why you might be interested in this servant event. Add your questions, and we will get back to you.